FCI # 331, Origin: Anatolia, Group 2.2 Molossoid Breeds. Grooming: Medium, Shedding: Medium, Coat: Short double coat. Color: Usually creme with the black mask, but generally all colors are acceptable. Ease of training: Medium, Energy level: Medium, Span of life: 12-15 years. Breed: Since the days of Babylon, the large, powerful dogs with the massive heads were living on the Anatolian Plateau. They were used as fighting dogs in the battles, as well as for hunting large animals, even lions and wild horses. This interesting scenes are depicted on the well-preserved Assyrian bas-reliefs, presented at the British Museum in London. In his homeland The Anatolian Shepherd Dog was not only grazing the cattle, but also he was guarding the flock, walking around it or climbing the high observation posts from which he could better see and sense a dangerous predators. Once Anatolian Shepherds see a moving object, even if it is a car - they are building a chain and run forward like a wind. Such a tactics of attack are naturally developed in this breed. Anatolian Karabash is a large dog, and a highly reliable keeper! Since ancient times and until now this dogs are used to guard the sheep herds in Turkey. This is a working breed, a dog, that is enthusiastically defending the family of the owner and his properties, and his cattle. The Anatolian Shepherd Dog quickly learns, he is faithful and affectionate with his owner, close friends of the family and children. Strangers should be carefully presented to this dog. To achieve the proper social behavior, the Anatolian Shepherd puppies should be introduced to different people and animals from the early age. The International Anatolian Karabash Club was founded in 1990 and at the end of 1993 had already 300 members from different countries: USA, Puerto Rico, Mexico, Canada, Germany and England. Most of the present owners of Anatolian Shepherd Dogs used to keep the German Shepherds, Dobermans, Rhodesian Ridgebacks, and Rottweilers before. Those who need a big guard dog, quickly become fanciers of this - still very rare - breed. Now the Anatolian Karabash is getting more and more popular in Europe and America, where people purchase this Shepherds as companion dogs or guards of the properties. Their popularity outside of their homeland in the last ten years has been steadily increasing. 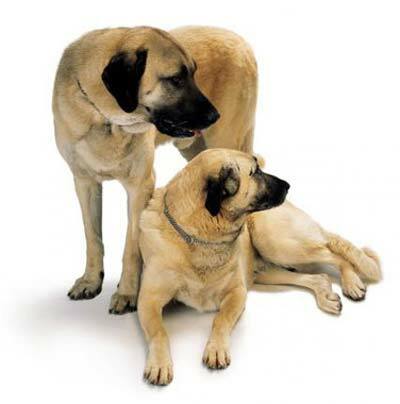 General Features: If we compare the Anatolian Shepherd Dog with the other herding breeds, we will clearly see many similarities with such breeds as the Great Pyrenees and the Kuvasz, but the Anatolian Shepherd has more slender body proportions, and he is faster and more nimble, than the breeds named above. The Anatolian Shepherd Dog is very proportional, and his muscles are relief and well-developed. One of the most characteristic features of the Anatolian Karabash is certainly his large head, thick, muscular neck, somewhat pendulous black lips and smooth, short and thick coat with a thick undercoat. There are many options for colors of the Anatolian Shepherd's coat, but most common is creme and white with the relatively large spots of any other color. Also, these dogs must have a black mask on the muzzle and very strong jaws. Head must be large with a broad skull, the transition from forehead to the muzzle is almost imperceptible - very smooth. The lips of Karabash should be slightly pendulous, his nose - always black and wet. Temperament: This strong and hardy breed, was formed under the influence of features of living and working outside of the house in any weather conditions. The Anatolian Karabash is very independent. He has a strong and very stubborn nature, so the owner of this dog must be domineering personality, always playing the role of a pack leader. 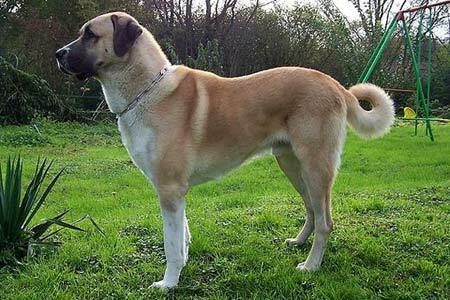 The Anatolian Shepherd is very loyal to his master and good-natured with the family and children, but he is very reserved with the strangers, he never trust people that he does not know, which makes him an excellent guard dog. In their homeland - in Turkey - the Anatolian Shepherd Dogs were always forced to adapt to a rather precarious living conditions: they are insensitive to both - cold and hot weather, they are unpretentious in food, they always know how to save power. This dogs can spend hours lying next to a herd, and at first glance it may seem that they are asleep, but if there is any potential danger to humans or animals, which they guard, the Anatolian Shepherd immediately jumps up and drives away the intruder or tis dog may attack, if he believes that it is necessary. Instinct to protect is developing in these dogs only at the first and second years of life. The Anatolian Shepherd Dog in most of the cases will never be eager to show his obedience to his master at once, but over time this dog is showing a fine reaction to the attention of the owner and if the relationship is built right, this dog is able to show an exceptional love and devotion for his master and his family. The immunity of the Anatolian Karabash is usually installed with a delay, because this dogs do not grow up the same fast as the representatives of the other breeds. In order to prevent the development of infectious diseases, the vaccinations for parvovirus at an early age are strongly recommended. These big dogs are not actually meant to live in the house. It is better to keep them outside on a large yard, where the Anatolian Shepherd will have a chance to perform the best of his qualities and have enough space to move and exercise. Do not forget - this area should be very well fenced, because the Karabash has an undisguised suspicion of strangers. This dogs require considerable exercise, and requires a large space to improve their racing skills. Training is better to be started from a very early age. The Anatolian Karabash possesses an independent nature, he has an inherent desire to dominate. Do not be surprised if he will be stubborn and unwilling to perform some commands, that are unpleasant or incomprehensible for him. On the walk you have to be very careful - try to choose the route, where you and your Anatolian Shepherd Dog will not have much chances to meet the other dogs. Anatolian Shepherd Dog - this strong and hardy breed - was formed under the influence of a very special (and pretty hard) living conditions. This dog had to work and perform his duties in basically any weather. The Anatolian Shepherd is distinguished by a calm and confident disposition, as well as by his extraordinary bravery. This dog is very smart, relatively easy to train, extremely loyal, resolute and quite active. When the Anatolian Karabash is raised up in the house, among people, he is always happy to be involved in all affairs of the family. With the familiar children, this dog is always very friendly, and he can be used as a four-legged nanny. With your properly educated Anatolian Shepherd you may leave your children and never worry, that something will go wrong. The Anatolian Shepherd is very territorial and he takes the owner's house, properties and belongings as his own. This dog will never allow anybody to approach his territory if this person is not properly "introdused" to the Karabash by his master. It is curious that the Anatolian Shepherd tend to occupy a position somewhere on the hill, from where he is able to observe his territory. This dog can live all year round in the outside in the yard, but in extremely cold weather it is better to provide him a warm corner in the house. Also the more close is the contact of the Anatolian Shepherd with "his" people (the owner and his family), the better communication level can be achieved between the dog and the people - in this case Karabash would become a really good friend and companion. Shepherd by his nature is somewhat stubborn , so his owner must be a person of power, playing the role of leader. Education of this breed requires a lot of sensitivity and the presence of a certain experience in dealing with herding and guarding dogs. Anatolian Karabash today - just like many years ago - is used to protect the livestock. Irreplaceable assistants of shepherds, these dogs live among the sheep, and they are behaving completely calm, but in case of danger they zealously protect the flock entrusted to them. Shepherds can absolutely rely on their four-legged guards. As a rule, the Anatolian Shepherds Dogs are free to decide how to act in any given situation, and therefore they are not very fond of the idea, that someone will give them orders. Health problems: Like most of the large-sized dogs, the Anatolian Shepherds are prone to hip dysplasia. Also they are sensitive to anesthesia.